The tournaments are done, the non-league games are in the rearview mirror, and now it’s time to separate the contenders from the pretenders. Buchanan has changed its philosophy to a faster pace and Clovis has a new coach in Jon Heinz. Central, the three-time defending Valley champs, round out a quality league top to bottom. There certainly won’t be a lack of entertainment every night when the boys lace them up every Wednesday and Friday night, so have a look below and get to know the teams battling each other over the next ten games, answering the question: who will rise up and call themselves TRAC champions? Players to watch: Cole Anderson, So; Alex Villi, Sr; Grayson Carper, Sr; Dez Walls, Sr; Dante Chachere, Sr.
Non-league action: The Golden Eagles won its first 12 games of the season including the NorCal Tip-Off in Rocklin and the Simi Valley Tournament on their way to 17 wins. In their own Nike Classic they fell to state No. 14 Modesto Christian 83-66 in the championship game, a day after beating then-No. 16 San Joaquin Memorial 79-75 in a hotly contested game. Their other loss was in the second round of the Modesto Christian Tournament, a 69-66 setback to Vanden. Clovis West is currently ranked No. 20 in the state by Cal-Hi Sports. Team breakdown: When you play for coach Vance Walberg every player on the floor must be able to play defense, get to the basket and shoot the rock. Well, the Golden Eagles are clicking with three-headed monster in sophomore Cole Anderson (20 ppg), senior Alex Villi (15 ppg) and senior Grayson Carper (11 ppg), all 6-foot-4 with long arms. Anderson, who broke the school record for points in a freshman season, is an elite shooter and Villi is a talented wing player who can stretch a defense and get to the rim. Carper is a threat from the outside as well. Mix in Dante Chachere, a Portland State football signee at quarterback, and 6-foot-5 Dez Walls and that’s a great core. Averaging 77 points per game they rotate players quickly and rely on a strong bench that features senior Luke Lowe, soph Marcel Sanders and junior Jarren Carr. Right now, they are playing the best basketball of anyone in the TRAC. Clovis East senior Shawno Roberts will be a top player in the TRAC this season. The left-hand shooting guard is averaging 13 points per game for the 13-3 Timberwolves. Players to watch: Jermal Pittman, Jr; Shawno Roberts, Sr; William Wiggins, Jr; Carlos Fuentes, Sr: Tyler Pacheco Jr.
Non-league action: The Timberwolves only three losses on the year were each in the Legacy Tip-Off in Las Vegas, the McDonald’s Winter Classic (to Folsom at the buzzer) and to Dublin in the championship game of the Clovis Elks on Dec. 29. Otherwise, they’ve played perfect basketball including a 76-67 win over Clovis North in the Winter Classic in Chico. Team breakdown: This 2018-19 Clovis East team is formidable, playing tough-minded defense and able to put the ball in the basket to the tune of 77 points per game while giving up an average of 59. A balanced team, they are led by junior guard Jermal Pittman (14 ppg), left-handed senior guard Shawno Roberts (13 ppg) and junior guard William Wiggins (10 ppg), the coach’s son. In addition, they have two sharpshooters in Carlos Fuentes and Tyler Pacheco. Coached by Adrian Wiggins, in his sixth year at Clovis East, the Timberwolves are off to a fast start and are a great bet to be one of the top teams in the TRAC. This core group of players have played together for a long time – a confident bunch who isn’t afraid of anyone. 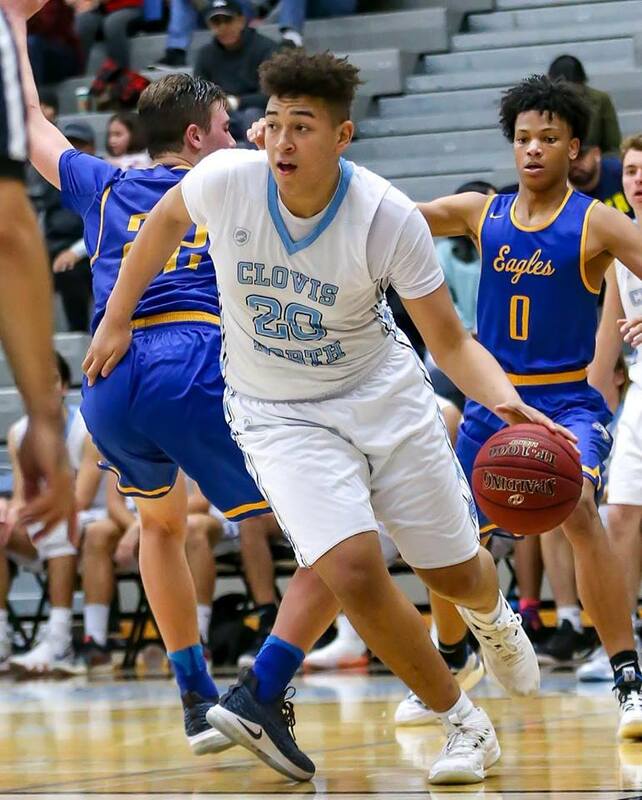 Players to watch: Sammy Al-saber, Jr; Steven Perry, Sr; Deandre Walters, Sr; Terri Miller, Jr.
Non-league action: Clovis North played in four tournaments, advancing to the title game of their own Valley Children’s Tip-Off before losing to Bullard 88-80. They lost two of three games at the McDonald’s Winter Classic in Chico before a great showing at the Clovis West Nike Invitational where they won three of four including an 83-71 win over San Joaquin Memorial. They placed third at the HOPE Elite Hoop Classic and had a huge home win against Bullard on Jan. 2, a game they came back to win 62-54 after down 35-22 at half. Team breakdown: Fast and furious, Clovis North’s tries to speed up the game and force its opposition to play their style, and this year it’s working quite well. The Broncos play extremely hard, force turnovers and aren’t afraid of taking offensive charges. With 6-foot-6 Terri Miller (12 ppg, 11 rebounds) patrolling the key with agility and a soft touch, Clovis Norths spreads the floor with a good array of shooters, a staple of Tony Amundsen coached teams. In fact, Amundsen, who won three consecutive Central Section titles at Bullard, has stated this is the best three-point shooting team he’s ever coached. Senior guard Steven Perry (18 ppg) is the squad’s primary ball handler who posses great range and junior Sammy Al-saber (10 ppg) has a quick release and oodles of confidence. Senior Deandre Walters (12 ppg) is a savvy guard who can get to the rim. Like Clovis West, they rely on a big bench and sub frequently. This is a fun team to watch. Players to watch: Charlie Barnes, Jr; Mason Marini, Jr; Alex King, Sr.
Non-league action: After dropping two of their first three games, Buchanan has a record of 10-5 including a consolation championship at the McDonald’s Classic in Stockton. At the Clovis West Nike Invitational they went 2-2 with wins over Ridgeview and Sunnyside and placed second to Sierra of Manteca at the Trojan Christmas Classic in Lodi. The finished their non-league schedule with wins over Paso Robles (61-46) and Stockdale (68-51). Team breakdown: In the past, Buchanan has relied on a half court game, slowing the game down as much as possible and working the ball for the best shot available. 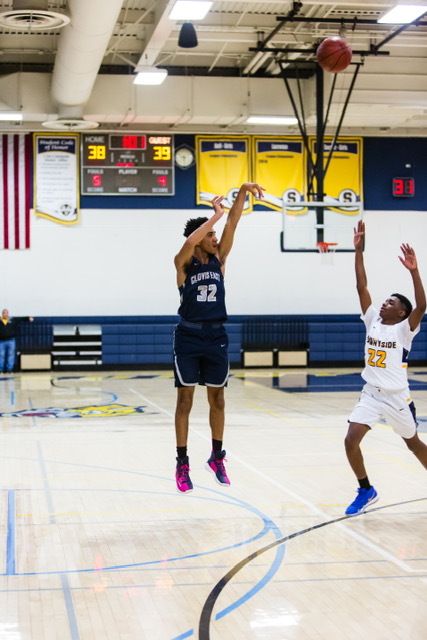 However, with every team in the TRAC pushing the action, the Bears have switched to a new style of basketball than in the past under coach Pat Geil, a style with more tempo and a guard-oriented offense. Led by junior guard Charlie Barnes (13 ppg), who earned two all-tournament awards, junior Mason Marini, a “glue guy” according to Geil, and one of the team’s best shooters in senior Alex King, they might surprise some teams with a crew that lacks experience but plays hard. Transfer Kyler Van Grouw, at 6-foot-6, 225 pounds, has good size and will help on the boards. Non-league action: Clovis stayed local for tournaments this year, opting to play in the Immanuel Tournament of Champions, the HIT at Hoover and their own Clovis Elks. After dropping their first game of the HIT, the Cougars won its next three: Redwood, Washington Union and Fresno Christian but come into league losing their last three to finish 8-8. Team breakdown: A long time Clovis Unified assistant coach, Jon Heinz takes over the Clovis program after spending the last two years as head coach at Caruthers, and now he inherits a program with little to no varsity experience. Last year the Cougars won its first league game in over two years but have a big void to fill after the school’s leading scorer, Anthony Martinez, graduated. This year Clovis will lean on a pair of varsity returners in Cal Stilson and Lovpreet Sran, both juniors. Stilson has the ability to score and create and Sran, after returning from a pre-season injury, is a versatile player who will be asked to play different roles on the court. Sophomore Dyson Ballard is averaging 13 points per game and is a quality shooter. Non-league action: After winning two of its first three games, it’s gone downhill fast for Central, the three-time defending Central Section champs. They Grizzlies lost eight straight games at the Jerry Tarkanian Classic in Las Vegas and at The Classic at Damien High in La Verne before beating Ridgeview and a good Liberty-Bakersfield team, just in time before league. Team breakdown: After graduating two four-year varsity players Cash Williams and Cam’Ron Wilson last year, Central has found it tough sledding in 2018. The three-time Central Section champs have leaned on seniors Jahmal Bartley (14 ppg), Justice Cole (12 ppg) and Sherrick Berry (12 ppg). With Central you know they will have good athletes and will be a tough matchup but they are not as talented as year’s past.